Anyone who’s come in close proximity to a sailing boat knows that they are tall. Really tall. So if someone suggested you tightrope between the masts of two raceboats you’d probably give it more than a few moments of careful consideration. Not Mich Kemeter though. 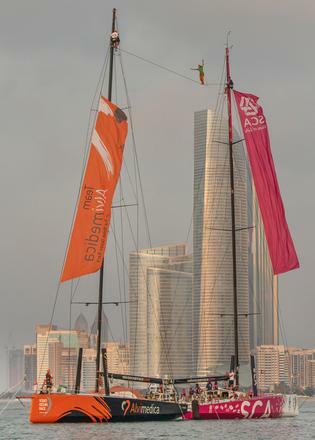 The professional climber, slackliner, base jumper and all round daredevil jumped at the chance to be the first person to ever walk a highline between two sailing boats at the Abu Dhabi stop during the Volvo Ocean Race. The two boats in question were Volvo Ocean 65s belonging to Team Alvimedica and Team SCA, providing Kemeter with a 22 metre long and 27 metre high challenge. “I never thought it would be such a hard way to achieve a successful walk,” Kemeter posted on his website after the stunt. “The boats within the line were constantly moving without and rhythm.” This may go some way to explaining why Kemeter was only able to make it halfway across the line – an impressive feat in itself considering the movement meant he was unable to concentrate on the fixed end point key to most trapeze walkers. Watch a trailer for the attempt below and the see the video in full here. Although the winds were light and the boats were each equipped with four anchors, even the slightest rocking motion meant the pressure on the slackline changed by up to 80kg in a matter of seconds. This challenge was made even greater by the curiosity of other boats, who would pass close-by and create even more waves. After 30 attempts to make what is thought to be one of the world’s most difficult crossings Kemeter was forced to call the challenge to an end. However, he says under different circumstances he’s sure it’s possible and plans to try again as soon as he has the chance.